PRAIA DA VILA, Santa Catarina/Brazil (Thursday, April 29, 2010) - Jadson Andre (BRA), 20, 2010 ASP World Tour rookie, has defeated former nine-time ASP World Champion and current ASP World No. 1 Kelly Slater (USA), 38, to claim the Billabong Pro Santa Catarina. "What do I say?" Ander said. "This is my dream. This is everything I have worked for in my life. To be on the beach and hear that I was the winner, something special came over me. I don't know how to put into words. It's a miracle. I have had some bad things happen in my life, but this is amazing. I am so thankful to everyone for this." "It's very important in terms of my ranking," Andre said. "Not only to help make the Top 32 cut-off, but also to help my seeding at J-Bay and Teahupoo. I know Kelly (Slater) can get a score whenever he wants so I tried my best to get scores early and keep the pressure on." "Adriano (de Souza) has been my hero for a long time," Andre said. "All the pressure has been on him these past years and I have learned from him. He is an inspiration and has helped me so much this year. It feels amazing to represent my home country and win here for Brazil." While Slater never quite found his high-scoring form in Brazil, the Floridian adapted to the conditions each and every round, exhibiting his dominant nature throughout the Billabong Pro Santa Catarina. The Runner-Up Finish sees Slater ascend to the top of the ASP World Tour rankings � a dangerous place considering the upcoming events. 'It definitely puts me in a good spot this season heading into Jeffreys (Bay) and Tahiti," Slater said. "I think it's been almost two years since I've led the rankings and yeah, it feels good. Obviously, you want to win every heat, but that said, I didn't lose to a Mick (Fanning) or a Joel (Parkinson) or a Jordy (Smith) who are probably bigger threats in terms of the title. Jadson (Andre) winning here today is special and it's probably something that he'll remember for the rest of his life." The current ASP World No. 1 showed little, if any, weaknesses throughout the event, only falling to Andre's hyper-kinetic forehand in the Final. "In these conditions it was always going to be tough to beat him (Andre)," Slater said. "I would have had to gotten the set waves and had sections to pull some airs off. He was pretty unbeatable in these conditions and he took down everyone. We'll see if he can match the performances at places like Teahupoo and Pipeline." Owen Wright (AUS), 20, 2010 ASP World Tour rookie, secured his career best result today, finishing Equal 3rd at the Billabong Pro Santa Catarina. The young goofy-footer soars from 23rd to 11th on the ASP World Tour rankings, putting himself in excellent position to make the Top 32 cut-off at this season's midway point. "I'm rapt with my result here in Brazil," Wright said. "The tide really filled in and it became challenging to find them out there. Kelly (Slater) can pretty much do anything and he was able to stay busy during that Semi. I'm stoked with 3rd and it definitely helps with the seeding heading into these next two events. I've never been to J-Bay before but I'm frothing to get there." Dane Reynolds (USA), 24, lived up to his reputation at the Billabong Pro Santa Catarina, logging in one phenomenal performance after another that culminated in the day's highest single-wave score, a 9.77 out of a possible 10 for a monster 360 Method Air on his backhand in the Quarterfinals. Unfortunately, Reynolds was unable to halt an early blitz from Andre in the Semifinals. "Jadson (Andre) really found a rhythm early and I wasn't able to get anything going until the end there," Reynolds said. "I felt like I was pushing through the waves a bit too much. It's okay though. Equal 3rd is a good result and it puts me in a comfortable position moving forward. I had a good time here in Brazil. I had some fun heats and I'm looking forward to the next one." Jordy Smith (ZAF), 22, fell to eventual Runner-Up Slater in the Quarterfinals but remained a standout in Brazil. The powerful South African's Equal 5th place finish sees him move to the ASP World No. 2 spot, an excellent position to be in heading into the next stop in South Africa. "Any time you get the chance to surf against Kelly (Slater) is a privilege," Smith said. "I stuck to my game plan of hunting the lefts, and he stuck to the rights which hadn't really been breaking all day. But he's Kelly and he can summon waves like that. I'm disappointed, but still happy with the way I surfed. It's another good result for me and I'm looking forward to getting good waves at J-Bay." The next stop on the 2010 ASP World Tour will be the Billabong Pro Jeffreys Bay from July 15 � 25, 2010. ATTITUDE: The Brazilians are rabid surfing fanatics. Everyone from capoeira instructors to frothing junior champions prowl the line-ups. The punchy beachbreaks boasted by the region offer opportune playgrounds for the light-footed aerial specialists on tour. THE WAVE: Brazil’s best beachbreaks, Joaquina and Imbituba, are generally smaller and shorter waves, but they can get powerful and hollow when it pumps. PERKS: Brazilian-cut bathing suit bottoms and caipirinha cocktailos – need we say more? PERILS: Again, Brazilian-cut bathing suit bottoms and caipirinhas cocktailos – need we say more? APRES SURF: Brazilians are renowned for their nightlife, spend some time in Brazil and you’ll know why. Things don’t get well and truly underway until the early hours of the morning though, pre-party with energy drinks. 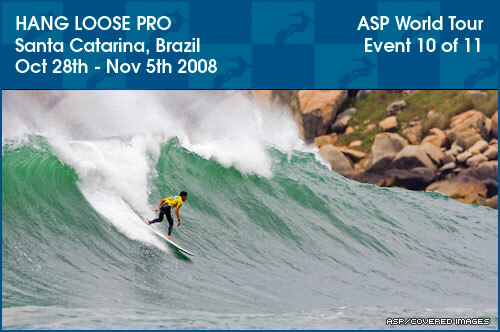 ASP WORLD TOUR HISTORY: Brazil has played host to many an ASP tour event over the past 30 years. Former contest sites include Rio de Janeiro, Barra de Tijuca and Saquarema, but the past four years have seen the tour set up shop in Florianopolis. NOTABLE: Falling towards the end of the tour, the past few years have seen several ASP world champions crowned in Brazil. In 2004 it was Andy Irons, in 2005 is was Kelly Slater (who had his 2006 ASP World Title already stitched up by Brazil). Last season, mighty Mick Fanning sewed up his first ASP World Title in Brazil, bringing the coveted cup back to the Aussies for the first time since Occy did it back in ’99.